The note 3 and 4 both had a I frame metal skeleton internally.that is why they pass bend test. Cheap plastic is what everyone said, but internally galaxy line has been metal this whole time. It is kinda like a metal spinal column instead of the iPhone exoskeleton. AnonD-53326, 11 Oct 2014Best phablet : Galaxy Note 4 Best normal sized phone : Z3 Best small phone : Z3 compact ... moreDuh, thats only your opinion. The hell you care to people buying iPhones? Its just happens they can afford it. Choosing gadget is a matter of end user's taste and no one cares for your choices as well. 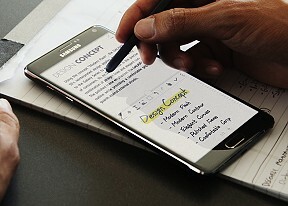 geordie81, 11 Oct 2014no, a lot of galaxy note users buy it simply for the size of the device not because its a so c... morenot necessarily, because not everyone who wants a big screen buys a Note. most buy other androids too, and most wanted the iPhone/iOS experience in a big screen, so they are switching. I just ordered mine today and I'm pretty excited to get my hands on this thing. Thanks for a excellent and proper review. I dont get it. There is no huge big software gains, and just a few hardware gains but a huge mark up. Buy if you want, but these things are more emotional show off buys than because they actually offer a big leap up in usefulness. Marginal gains that have no real material difference in your life. Great as usual from Samsung, but marketing hype should not sway your rational purchase. Really, why buy it? You have to get the Note 4 in your hands to truly appreciate it. I was concerned about the single metal band as well but it really does feel like a premium phone. Plus I like having the option of expanding the memory and having a removable battery. You cant have that with a completely metal build. Also, for being a more "cheap" phone compared to the 6+, it def appears to hold up better in the "bend" tests...but to each their own. I can't believe how people still buy iPhones. yeah, 11 Oct 2014this is stupid, especially considering the fact that no other phone/phablet comes with a stylu... moreI seems to me that your friends bought the "Lamborghini Aventador" but they chosed for whatever reason to use less than 50% of its power. It`s just stupid to compare the iphone with the Note series, it is ridiculous! The only real competitor for the Note 4 might be the BlackBerry Passport (and yeah , it has no spen but it seems to be a brilliant designed device). No mention of the cpu alternative - the Exynos 5433? It is 64bit and 20nm whereas Snapdragon 805 is 32bit and 28nm. It may matter because also Android will be upgraded to 64bit as of the next version. I know a lot of galaxy note users, and about 90% of them dont even use the stylus. they just buy it for the status symbol, same as most of you consider us apple users. None of the negatives are worrysome except perhaps the gap. Will the gap be a collector of dirt perhaps even wedging the display and frame further apart? Will the gap lower the water resistance? I miss a closeup photo but will certainly check at the store. usb3 would have been nice for faster offload of photos and videos onto a usb3 portable wd passport drive OTG but was perhaps downgraded to usb2 for the lower battery draw OTG and thereby heat generation. I hope gsmarena will review also the mate7, the vibepro2 and in particular the nexus6. Graphics performance wise, both off screen and onscreen(compromised by screen resolution) it still cant beat iphone which is evident in benchmarks. Battery life, well it beats iphones which I dont know why apple cant fit large capacity batteries into their devices or maybe they are confident with the iPhone's power management and results are hell yeah just decent not stellar. Lets leave display comparison to the user since its anyones preference between Amoled or LCD. And most importantly camera performance, well just wait for the proper GSMArena shootout for a hopefully unbiased tests. AnonD-209094, 10 Oct 2014Did we read the same review? In GFX T-REX Onscreen it scores only half of ip6+ and in the Manh... moreYeah.. Apple actually designs their own SOC's.. although they get someone else to fab it..
Samsung and all other Adnroid makers rely on Snapdragon designs from Qualcomm.. It's impressive to see a slow clock SOC beat the faster clocked Snapdragon.. but most don't understand it's not the speed of the processor - its how many calculations ( how much work ) can be done per 'clock tick'.. If you can do more work per tick ( like Apple ) you can do as much work ( or more ) then a faster clocked cpu ...PLUS.. you don't run as hot AND - this is big - you use less power ! This is how Apple can use smaller batteries and get good battery life..
Can't wait to get mine!!! Dododo, 10 Oct 2014What's with the really stupid comments? The Note 4 camera is improved compared to the previ... moreThe problem is too many Android makers use Camera Mp's as a marketing tool to sell phones. All pics get downgraded to 2 Mp's ( most smartphones )or 3 Mp's ( Note 4 screen ) when viewing on that smart-device ... as this is the screens max resolution. You can record in 4k ... great.. that's 8Mp !! ( the iPhone 6 camera resolution ) - now you need a 4k screen to enjoy it.. PLUS.. you need tons of free space to make decent movies.. I'll stick with my HTC... anyone who needs that kind of Mp's in a camera will buy a professional camera. Try being a pro-photog and showing up at a wedding with a Note 4 and see how fast you get fired..
My HTC takes good pics..
Who the hell needs that much resolution ? The note does 4k videos - 4k video = 8 Megapixels.. So you play back a 4k video onto the Notes 3Mp screen? Most will be playing back on a 1080 widescreen home tv where it looks big.. This is why BIG Megapixels is a marketing gimmick for most of us.. Since every manufacturers' aces has been laid down, Im excited for GSMArena's camera shootout for this topdogs. It will be funny reading each camps' debate rebuttals. I would hate to be involved with planning the Note 5. There is really not much more they can do to improve this series. Sure they can use some more metal or waterproof it, but it seriously looks as if they are reaching the limit for technological advancements.